Love him or loathe him – and there are plenty who sit on either side – James Franco is perhaps the ultimate multi-hyphenate, seemingly unconcerned about what anybody thinks and certainly not afraid to undertake projects that put him at risk of ridicule. To his credit, Franco seems unconcerned about such scrutiny and, in addition to acting roles in films (127 Hours, Spring Breakers), on television (Freaks and Geeks, General Hospital) or on stage (Of Mice and Men), he has also tried his hand at directing for both stage and screen, releasing music, hosting the Academy Awards, staging art installations and writing short stories. It is the last of these, a collection published as Palo Alto Stories, that have been adapted into Palo Alto by Gia Coppola, the granddaughter of Francis Ford Coppola and niece of Sofia Coppola making her directorial debut. Franco has claimed that the stories are drawn from his experiences growing up in Palo Alto and Coppola, who also wrote the screenplay, delivers a somewhat bleak but not altogether unlikely examination of the daily lives of teenagers living in this city situated 35 miles south of San Francisco. 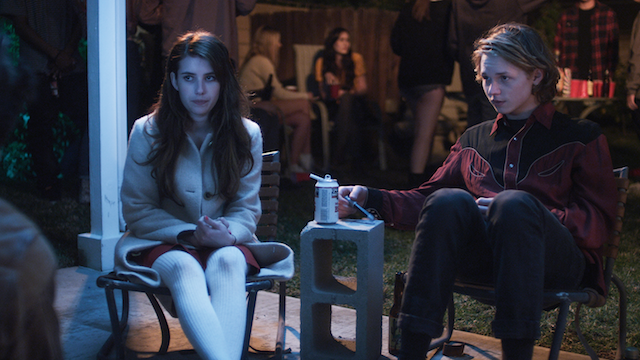 Palo Alto is ostensibly about four teenagers wiling away their time doing very little of significance, which in itself is not a problem because the reality is that young people often find themselves at a loss for ways to spend their time productively, particularly when there is no real expectation for them to do so. Emma Roberts is April, a virginal loner who has a crush on Teddy (Jack Kilmer) whilst also embarking on an illicit dalliance with her soccer coach Mr B., played by Franco himself. Also in the picture are the reckless Fred (Nat Wolff) and the attractive Emily (Zoe Levin), whose willingness to engage in sexual favours never brings her the emotional connection she craves. There is lot of accuracy in the behaviours of these teenagers. From the bitchiness of April’s friends to the awkwardness and stilted nature of the conversations between April and Jack, or the aggressive, destructive behaviour of Fred and his desperate need for Jack’s approval, even if he could never possibly admit to any vulnerabilities, or even Emily’s desperate search for somebody to love her, however misguided her efforts. For all these young people, there is little oversight in their lives. Parents are either absent or complete douchebags and it is not difficult to understand why this group find themselves meandering aimlessly though life. It is easy to see how they have become so disillusioned and disconnected. As April’s step-father Stewart, Val Kilmer’s performance is almost as awful as his character, a most ridiculous figure who seems to spend his days smoking pot, playing video games and compromising April’s school results, while her mother Jane (Jacqui Getty) is vapid, vacuous and equally detestable. It is little wonder that April finds herself drawn to Mr B., the only adult in her life who shows any interest in her, even if that interest is less than honourable. April finds no real joy in the endless partying, yet she participates for lack of anything better to do. Likewise, Teddy is basically a good kid who suffers at the hand of his so-called best friend Fred, a dangerous influence with little regard for anybody but himself. The film is visually arresting at times and effectively captures the listless, aimless nature of these teenager’s lives. However, Coppola hasn’t really pushed the envelope with regard to the themes and experiences of the characters and it seems as though she has tried to make an edgy film without really being prepared to take any risks. Likewise Roberts, in what is essentially the lead role, has failed to capitalise on this opportunity to expand her output beyond the type of characters – bland, wholesome and boring – that she has portrayed so many times before. There is plenty of potential in April as a character, but neither Roberts nor Coppola seem interested in finding it. As it turns out, it is the other second-generation actor in Jack Kilmer who emerges as the standout in a film that is really good in parts, but ultimately suffers from a lack of grit. 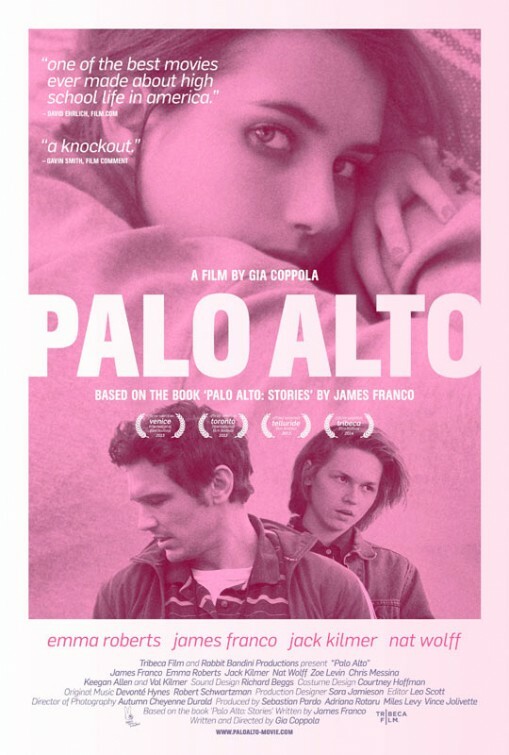 Stylistically and thematically similar to films from Larry Clark (Kids, Wassup Rockers) and Gus Van Sant, (Elephant, Paranoid Park) there is a resonance absent from Palo Alto that prevents it from reaching the heights attained by either of these two filmmakers in their depictions of young people and youth culture. The film is both mesmerising and infuriating at times and it is a lack of consistency that ultimately prevents it from being something truly special.